North Carolina’s assault on teachers has to stop. North Carolina is pushing its best educators out. We have to do something. Protesters participate in the Moral Monday March and Interfaith Social Justice Rally in Raleigh, N.C., on July 29, 2013. To keep talented teachers in the state, North Carolina citizens must march on. My son Ben’s language arts teacher emailed one morning this winter to tell me she is leaving Ben’s school. I feel sick, but I don’t blame her. Three of Ben’s middle school teachers have left in the past year. North Carolina’s intentional assault on public education is working. It is pushing our best teachers out. Ten years ago my family moved to Chapel Hill. A relatively low cost of living and bipartisan commitment to public education made North Carolina immensely attractive. There is plenty of historic precedent for devaluing public education in the South, and for many years North Carolina was not much different from its neighbors. In 1997 the state ranked 42nd in teacher pay. The year before, Gov. Jim Hunt had run on a platform to invest in public education. After he was elected, he worked with Republican House Speaker Harold Brubaker to focus on excellence in teaching and raised teacher salaries up to the national average in just four years. That bipartisan investment paid off. In the 1990s our public student test scores rose more than any other state’s. North Carolina became known as “the education state.” As recently as 2008, North Carolina paid teachers better than half the nation. Things can change quickly, especially if you’re not looking. Now, the brand that attracted us—“the education state”—sounds like a grim joke. After six years of no real raises, we have fallen to 46th in teacher pay. North Carolina teachers earn nearly $10,000 less than the national average. And if you look at trends over the past decade, we rank dead last: After adjusting for inflation, North Carolina lowered teacher salaries nearly 16 percent from 2002 to 2012, while other states had a median decline of 1 percent. A first-year teacher in North Carolina makes $30,800. Our school district lost a candidate to a district in Kentucky because its starting salary was close to $40,000. It takes North Carolina teachers more than 15 years to earn $40,000; in Virginia it may take only four. Gap store managers on average make about $56,000. If you talk to a teacher in North Carolina, you will hear the bitter truth of how difficult it is for them to make ends meet. Most teachers at Ben’s school work at least one extra job. An elementary school teacher told me that his daughters do not have the chance to play soccer or cello like his students. He has no discretionary income left to spare. What are we teaching our children about the value of education? When my boys see a teacher outside school, they rush up to say hello, eyes bright with admiration and respect. How I wish our children could minister to the adults in my state. While the majority of us remain quiet, North Carolina teachers face incessant reminders that they are not valued. How did this happen? Both political parties share responsibility. When the recession began, the Democrats in power froze teacher pay. After years of salary stagnation, in 2013, Republicans made the following changes: Job security in the form of tenure was abolished. Extra pay for graduate degrees was eliminated. A new law created vouchers so that private academies could dip into the shrinking pool of money that the public schools have left. While requiring schools to adopt the Common Core standards, the legislature slashed materials budgets. According to the National Education Association, we fell to 48th in per-pupil expenditures. State funds for books were cut by about 80 percent, to allocate only $14.26 a year per student. Because you can’t buy even one textbook on that budget, teachers are creating their own materials at night after a long day of work. As if that weren’t enough, the legislature eliminated funding for 5,200 teachers and 3,850 teacher assistants even though the student population grew. North Carolina public schools would have to hire 29,300 people to get back up to the employee-per-student ratio the schools had in 2008. The result? Teachers have more students, no current books, and fewer professionals trained to address special needs, and their planning hours are gone now that they must cover lunch and recess. For public school teachers in North Carolina, the signals sent by this legislation are unambiguous: North Carolina does not value its teachers. I cannot watch all this anymore and stay silent. So I’m acting out of character. At 8 a.m. one Friday last month, I went to a PTA meeting. I was nervous. It was my first time, which was embarrassing because my youngest is in fifth grade. As I walked in, another mom put me at ease. She said, “I hope it’s not too hot in there.” Under her fleece, she still had on her pajama top. She came to hear about the “Pay our Teachers First” campaign I created with a middle school teacher. Our goals are to raise awareness and deliver a simple message to North Carolina representatives: Pass legislation to get teacher pay back up to the national average, or we will vote you out. Some people tell me this fight is futile—that Chapel Hill is a tiny blue bubble in a big state gunning to destroy public education. Recent polls suggest they are wrong. 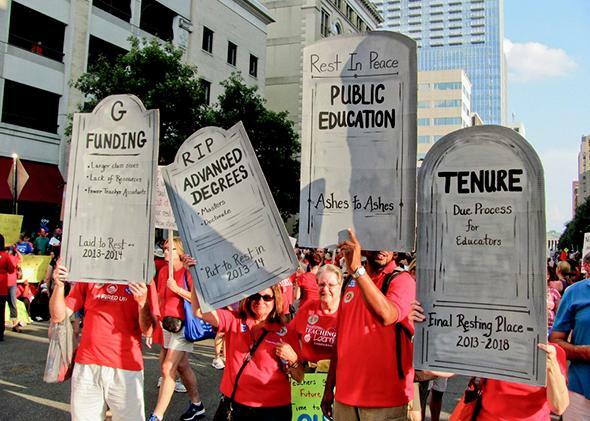 A nonpartisan survey from October 2013 showed that 76 percent of North Carolinians agree that public school teachers are paid too little, 71 percent think we cannot keep the most qualified teachers with the current pay scale, and 83 percent support increased pay for higher degrees. I love these data. They prove that the recent legislative assault on teachers does not reflect true North Carolina values. In November parents and teachers met in my home to listen to the teachers’ concerns and make a plan of action. We learned that, only a few months into the school year, our middle school had no more paper and printer ink and no funds to buy more. The next morning, parents brought them in. We are organizing volunteers to supervise lunch so our teachers will have a planning hour. I used to think “wearing red for public ed” on Wednesdays was silly. Now I understand that this quiet gesture shows we hear the demoralizing messages from Raleigh, and we disagree. A social studies teacher and I designed a red “Pay our Teachers First” T-shirt and a website to raise money and awareness. One chilly morning, parents and children held signs and cheered as teachers walked into work. A math teacher was so moved by this rare sign of recognition, she burst into tears. Our children made a film to encourage generous holiday donations. My neighbor Melinda set up a crowdfunding site to collect them. More than a hundred generous gifts came in so quickly, the Deposit a Gift site owner called to ask for our secret. Meanwhile, booster campaigns and rumors of better pay do not stop teachers from leaving our schools. With every report of another talented teacher lured away from the profession or to another state by much better pay, I fear if we don’t act fast, our public schools will hemorrhage talent in the next year. In an anonymous survey of the middle school teachers at my son’s school, half said they are looking for other jobs. There is so much more to do. We have to let our teachers know we have their backs. Although parents divide along so many lines—religious or secular, liberal or conservative, vegetarian or meat-eating, working in or outside the home—most of us deeply value our public schools. Together, we will test Margaret Mead’s belief “that a small group of thoughtful, committed citizens can change the world.” Our children face a powerful, well-financed threat. We must show them we are here to protect their future.